The apple maggot is native to eastern North America. Today apple maggot has spread throughout most of North America. 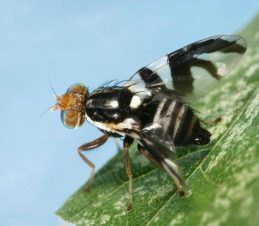 A single adult female was detected in West Kelowna in 2015, but the Southern Interior of BC is still considered the last major apple growing area of North America free of apple maggot. While apple, crabapple and hawthorn trees are the primary hosts, the apple maggot has been reported in plums, apricots, pears, cherries, spreading cotoneaster and wild rose hips. Report ALL sightings in British Columbia Interior. Call 250 470 4884 and ask to speak to plant health staff at the Canadian Food Inspection Agency. Help prevent the spread of Apple Maggot! See more information from the Canadian Food Inspection Agency here: Apple Maggot CFIA.